We had planned to spend the Bank Holiday weekend in Italy paying the next tranche of money and finalising the layout of sanitary ware in the bath room. 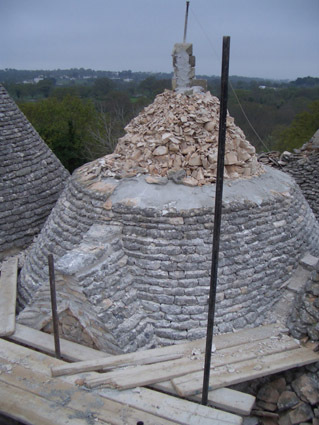 The stone mason has started work on the first cone and has even provided some weathered stones from his own private store. This is to prevent the piebald appearance found in restored Trulli, so concerned is he to do a top notch job on such an unspoilt property. But this start was sufficiently delayed that the small amount of progress meant it was not worth visiting. Part of the deal with low cost airlines is the gamble of booking far in advance to get the best prices. If we book closer to when our plans are certain the cost will have gone up. We fly often enough that it is marginal if it is worth paying the rearrangement fee. In this case there were no suitable dates in our time window and the October flights are not yet released so it was cheaper simply to chuck the tickets in the bin. Some you win, some you lose, but overall it is the cheaper strategy. Plus it has saved us a night at the Radisson SAS at Stansted, two days car hire and two nights in Lo Smeraldo hotel. Instead we stayed home and worked in the garden. Over the last two weekends we have done good stuff planting plants, drastically pruning shrubs, re-felting the summer house, stacking the log pile, macro-weeding and other sundry maintenance tasks. All of which will make for a flower filled summer to look forward to. Plastic urinals - whatever next?